Microsoft announces its first hardware product, the Z80 SoftCard. The SoftCard is a microprocessor that plugs into the Apple II personal computer allowing it to run programs written for the CP/M operating system. CP/M was a very popular OS for early personal computers along with much of the software written for it. In particular, the word processor WordStar is so popular that people will purchase the SoftCard and a companion “80-column card” just to run it on the Apple II. At one point, the SoftCard product will bring in about half of Microsoft’s total revenue. 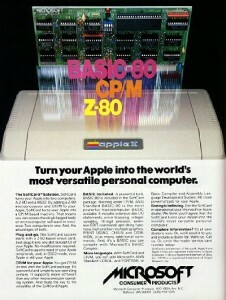 It will be discontinued in 1986 as CP/M’s popularity waned.